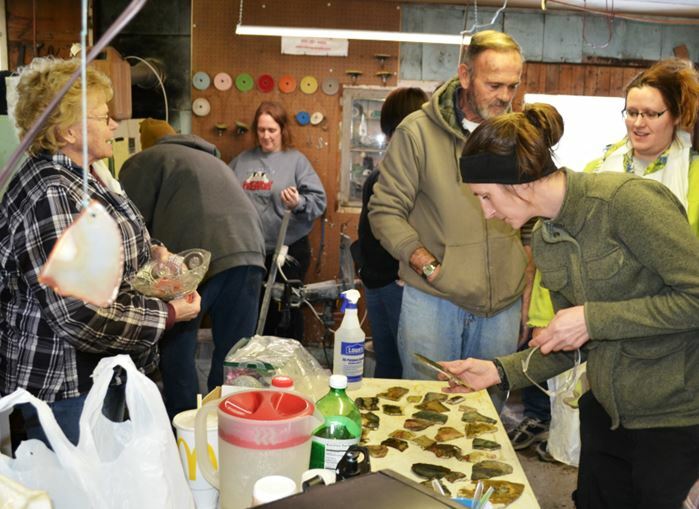 All who attended the January workshop of the Wayne County Gem and Mineral Club acquired a nice unpolished slab of morrisonite jasper from the club collection. Most present at the event struggled to identify the “best” piece remaining when their raffle number was drawn. It was all so colorful and each piece was unique. I went home with my piece and decided to learn a bit more about my newest acquisition. Amanda’s number has been drawn and she is selecting her piece of morrisonite from those remaining on the table. Morrisonite is a unique form of picture jasper from a small region of Malheur County in extreme eastern Oregon. 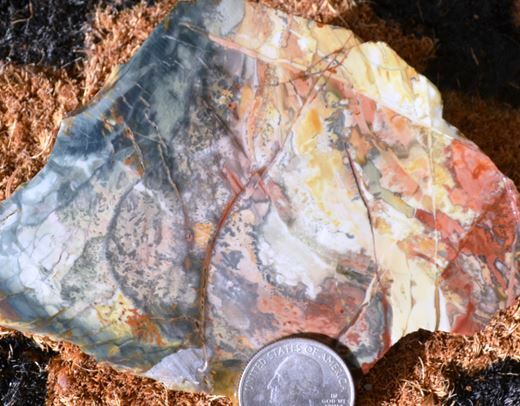 The unique rhyolite has been called by some “the best picture jasper in the world”. The combination of pattern variation and colors is such that no two pieces look alike. This was certainly true of the 30 or so pieces that were offered to club members at the workshop. 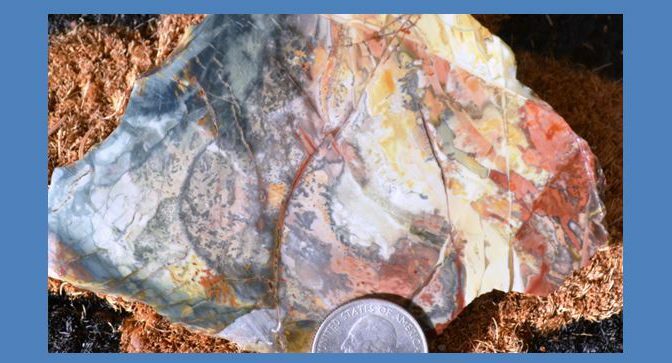 The colorful jasper formed when volcanic ash or other very fine particulate matter was trapped within highly silicic rhyolite flows as the lava cooled. The silica is cryptocrystalline (i.e. chalcedony) and it is these entrapped particles that impart the color and pattern. The freezing from magma happened fast and chaotically. Most of the rock in the region is garden variety pinkish rhyolite, but locally the silica content was higher allowing colorful jaspers to form as the lava flows were converted to rock. The rhyolite flows of eastern Oregon were sourced from the McDermitt Caldera in northern Nevada which erupted about 16 million years ago in the Miocene Epoch. Interestingly, that volcanic activity was generated by the same mantle hot spot that now resides under Yellowstone Park. The North American continental plate is migrating WNW over the stationary mantle hot spot, effectively transporting older volcanic rock west. This is my piece with about the 12th pick. It is more colorful than my picture indicates. I am not sure if I plan to cut out a nice shape or polish it as it is. What would you do? Morrisonite is named after the rancher who discovered the colorful rock in 1947. Jim Morison (yes with only one r) found it one day while out exploring the remote regions of his large ranch. Since then the location has been claimed and mined a couple times; from 1986 to 1996 it was mined by Eugene Mueller of The GemShop (Mueller, 2011). The remote location makes it very hard to work. It is on the side of the steep slopes of the Owyhee River. Primitive roads did get close at one time, but today the site is on BLM land that is considered too remote and rugged for access and the region is considered closed. As a result, prices for high quality morrisonite have risen to as much as $250/pound in Tucson. That is, if you can even find any. If you scored a piece at last month’s workshop, go put a nice label on it and consider yourself fortunate. I wonder what Linda will bring out next month?